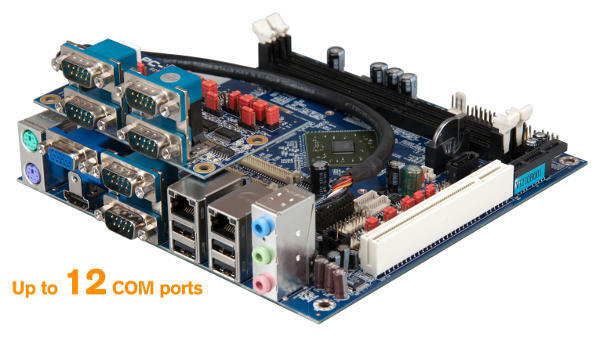 VIA has just released the first quad-core mini-ITX boards on the market, but the interesting bit is in the ports. Yes, your craving for a 12-serial port mini-ITX board with four cores can now be sated. 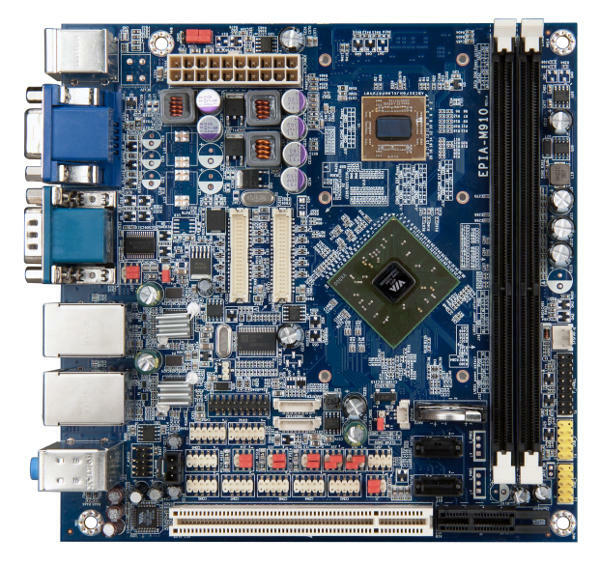 There are two boards, the EPIA-M900 and EPIA-M910, both are mini-ITX boards with quad-core 1.2GHz Nano E-Series CPUs. The M900 is pretty vanilla for a mini-ITX quad core board, if you can say that without your head hurting. It has a PCIe 16x (8x electrical), GigE, PCI, 2 SATA, 8 USB2, 4 COM ports, VGA, HDMI, and 2 LVDS ports. It can also take 2 DDR3 SODIMMs totalling 8GB. From there, the M910 is anything but normal. It upgrades the SODIMMs to full DDR3 DIMMs, but the space required means no PCIe 16x slot, it only has a 1x flush up against the PCI slot. There is also a useful second GigE port on the backplate. If you don’t consider that odd, look at the picture below. It may only look like this M910 has six COM ports, but there are headers for two more on the board to make eight in total. If that isn’t enough, you can add four more to have, as the picture says, 12 COM ports. See what we mean by not vanilla? COM ports are about as useful nowadays as ethics in the banking industry, with one exception, the embedded market. For kiosks, digital signage, and other similar devices, COM ports rule the day. Guess what markets the M910 is aimed at? For that, the four monitor outs and multiple USB, COM, and other bits are a godsend, no more add-in cards needed to make that stupid machine that sits in the corner with the BSOD taunting users, this board should do it all.